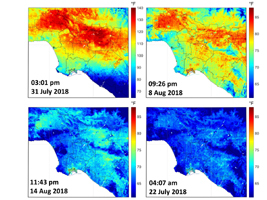 ECOSTRESS captured surface temperature variations in Los Angeles, California between July 22 and August 14 -- a period of extended heat -- at different times of day. The images show how different surfaces within the cityscape warm and cool throughout the day. They have been colored to show the hottest areas in red, warm areas in orange and yellow, and cooler areas in blue. The hottest areas are dark asphalt surfaces that have very little shade during the day and remain warm throughout the night due to their higher heat capacity. They include freeways, airports, oil refineries and parking lots. Clouds and higher-elevation mountainous areas were the coolest. (Note that in the lower right image of Figure 1, reds correspond to temperatures in the 80s. The single, larger image from the same time shows a slightly different scale to highlight detail -- and reds correspond to temperatures in the 70s). 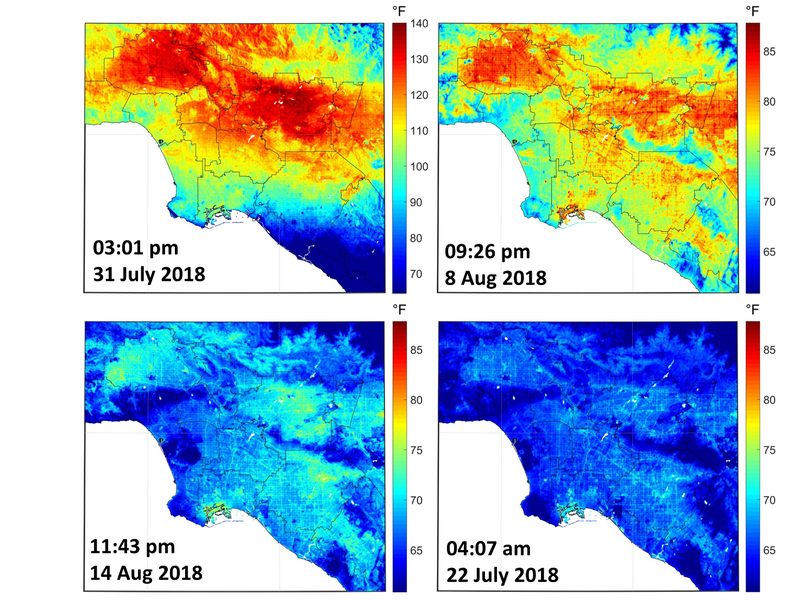 ECOSTRESS launched on June 29, 2018 as part of a SpaceX commercial resupply mission to the International Space Station. Its primary mission is to detect plant health by monitoring Earth's surface temperature. However, surface temperature data are also useful in detecting other heat-related phenomenon -- like heat waves, volcanoes, and fires. JPL built and manages the ECOSTRESS mission for NASA's Earth Science Division in the Science Mission Directorate at NASA Headquarters in Washington. ECOSTRESS is an Earth Venture Instrument mission; the program is managed by NASA's Earth System Science Pathfinder program at NASA's Langley Research Center in Hampton, Virginia. For more information on ECOSTRESS visit https://ecostress.jpl.nasa.gov/.